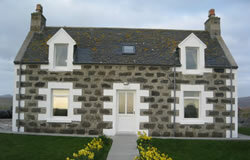 Machair View is a newly renovated cottage situated on a working croft in the township of North Boisdale. The house overlooks South Uist’s world renowned Machair with an abundance of varied Flora and Fauna on the doorstep, notably the rare corncrake and wild Machair flowers. It is only a short walk to the beautiful sandy beaches which run the length of South Uist’s west coast. • Fully fitted kitchen with electric hob and oven, integrated dishwasher, fridge freezer, microwave oven, dining table with chairs and plenty of crockery and cutlery. • Comfortable lounge with 2 sofas, TV with Freeview and DVD player. • Upstairs bathroom with bath and electric shower. • One double bedroom (With TV/DVD) and one twin bedroom, sleeping a total of 4 people. • Externally, there is a traditional Lean-to outhouse which serves as a utility / drying room with washing machine, tumble dryer, sink and plenty of storage space. • Broadband and wifi are available throughout the house. Mobile phone reception is available for most networks in or around the house. Sorry, due to livestock and the resident croft collie, we can’t accept pets. The house is also strictly no smoking. Our week starts on a Saturday with an arrival time from 4:00pm, through to the following Saturday, with a departure of 10:00am. You will be met on arrival to be shown around the house and facilities. Prices range from £300—£350 per week and is inclusive of all linen, towels and energy costs. For further details and to check availability, please contact Marina at marinapaterson@hotmail.com or telephone 01330 825547. To make a booking, a £100 deposit per week confirms booking (Non refundable if booking cancelled) and balance due 3 weeks prior to arrival.